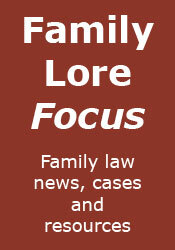 Family Lore: Pre-nups to be enforceable? According to the Sunday Telegraph today, the Law Commission will recommend that prenuptial agreements be made legally enforceable. A consultation paper will be published within the next two weeks, after the Supreme Court decision in Radmacher v Granatino is pronounced. Unfortunately, the report is a little confusing. We are told that recognising pre- and post-nups is only one option that will be included in the consultation (which suggests that not recognising them is another option), but later that the "Commission will propose a series of options for legally binding pre- and post-marriage contracts". The report goes on to say that the Commission is also "expected to set out a series of 'best practice' guidelines, designed to prevent spouses being coerced into signing draconian pre-nup contracts", such as (unsurprisingly) requiring them to show that they had each received independent legal advice before signing. Further, we are told that: "pre-nups that left children in penury and the ex-partners of wealthy men or women at the mercy of state handouts would also be unlikely to be legally binding". Whatever the consultation contains, it seems that pre-nups will shortly be the topic of conversation amongst family lawyers, although as with so many of these things, I am not sure that any changes (whether coming from the Law Commission or the Supreme Court) will have quite the impact that the hype suggests they will. There will no doubt be continued aversion to pre-nups for being 'unromantic', and they are essentially only for those with something to lose. For example, most young couples get married with few or no assets - are they going to bother with pre-nups? I doubt it.